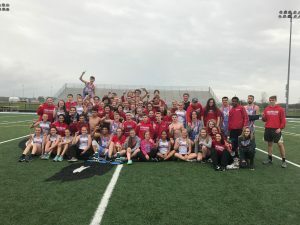 The boys track team won the Mac Invite and came in second to Kokomo here recently. We had several first place finishes on the night. Shemar Austin won the 200 and the 400 with Sam Bourne having a PR in the 1600 in the win along with Paxton Kintner in the discus and Jacob Shaffer in the shot. Gemini Williams won the long jump while Braiden Walton took first in the pole vault. The other 1st place finish was the 4×800 consisting of Jordan Edgington, Fletcher Williams, Same Bourne, and Jacob Edwards. We had many other team members PR and place in the meet giving us the victory. This is a great group of guys to work with that keep striving for excellence by setting and attaining new goals. They are putting themselves in a place to be conference championship contenders and potentially place in sectionals to move onto regionals.